This MeadowLyon continuous-line pattern can be repeated above or below itself to cover a quilt with Edge-to-Edge quilting. We recommend starting alternate rows in a different spot and on many patterns have indicated the place we recommend on the bottom edge of the pattern. This will prevent the animals (or motifs) from standing on top of themselves. Of course you can start alternate rows wherever you like. Our registration system prevents upper and lower rows from touching when you slide the pattern in increments of 3 inches; eg. 3”, 6”, 12” etc. For accurate placement, align the bottom line* (or dots or corner points) to the previous top line. You might do this by lowering the needle at the exact top right hand corner of the panel recently completed, then inserting a pin at that point. Roll the quilt and after shifting the pattern and replacing the clamps, move your needle once again to that point and adjust the laser to the point recommended for alternate rows. 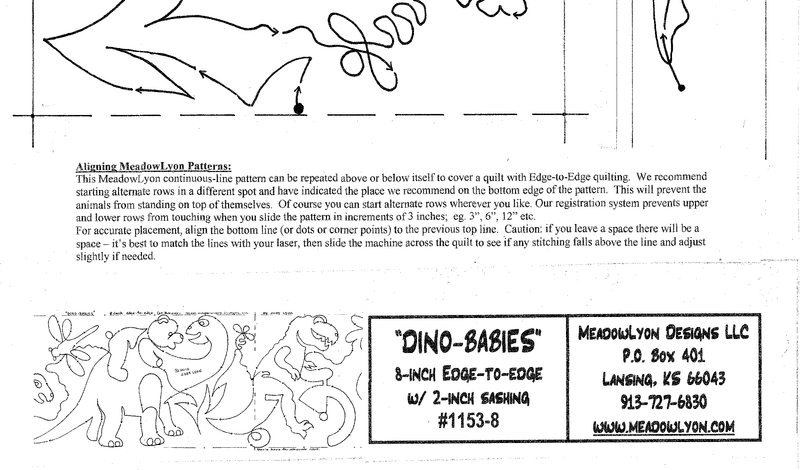 Caution: if you leave a space there will be a space – it’s best to match the lines with your laser, then slide the machine across the quilt to see if any stitching falls above the line and adjust slightly if needed. * Note: If your pattern does not have a bottom and top line, you can draw it in by laying a yardstick along the lowest points (or highest) on the paper pattern and drawing a line to intersect with the dashed line at the end of the pattern.